In the absence of an intact corpse, families often gather for memorial services rather than funerals. 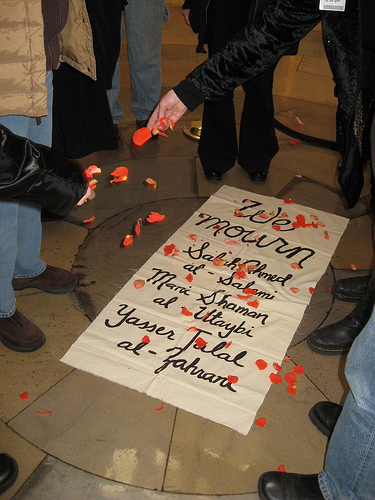 The families of Salah Ahmed Al-Salami, Mani Shaman Al-Utaybi, and Yasser Talal Al-Zahrani – three Guantánamo prisoners whose earlier purported suicides were declared “asymmetrical warfare” by the Bush Justice Administration – received Salah’s, Mani’s and Yasser’s broken and lifeless bodies. Previously the families had gathered to wake their loved ones, after authorities in their countries informed them that their sons had died in Guantánamo. Following three grueling years of unanswered questions and heartache, Scott Horton’s recent article in Harper’s Magazine has revealed that the deaths of these three detainees may not, in fact, have been due to suicide, but to having been tortured to death in U.S. custody. Compelled to act by this tragic news, fourteen members of the Witness Against Torture fast were arrested in the Capitol Rotunda on Thursday, January 21st for holding a memorial service in remembrance of the three men. The activists paid respect to the families of the dead in the very room where U.S. presidents are historically waked, adorning a makeshift burial shroud with handfuls of rose petals and filling the enormous Rotunda with story and song. The Yemeni and two Saudis have stories much like many of the other men who were (and still are) indefinitely detained at Guantánamo; snatched and handed over to the United States for bounty money, 16-year-old Al-Zahrani spent the last five years of his short life in custody. Al-Utaybi, orphaned in his youth and described as “a peaceful person who would harm no one,” was intercepted after traveling to a conflict zone that straddles Iraq, Afghanistan, and Pakistan to do humanitarian work. The U.S. Justice Department has no evidence linking Al-Salami to Al Qaeda or the Taliban. Two of them had already been cleared for release by the U.S. government; it was determined that they could not be held any longer, and they were flagged, finally, for return to their home countries. All three were on hunger strike to challenge their illegal detention. Although I had never met Salah, Mani, or Yasser, I could imagine the three Muslim men hauled out of their tiny cells on that dreadful night in June 2006. I could see their eyes fill with terror as their head, arms and legs were strapped to their chairs, writhing in pain as military personnel gouged at their eyes and bent back their fingers. Struggling for air as rags were forced down their throats, and then gasping, panicked, hooded and silenced, they finally left this world. The bodies of the three men were returned to their families mangled and beaten, and, interestingly enough, in pieces. The U.S. government has refused to provide the families with their loved ones’ throats. We entered the Capitol last Thursday – the one-year anniversary of President Obama’s inauguration – with hopes that this small act of remembrance would commemorate the lives of those we had never met. In the very spot every U.S. President has been laid before burial, we shared the lives and mourned the untimely deaths of our three Muslim brothers, tortured and killed on behalf of our “freedom” and in accordance with our country’s “justice”. As I moved to lay our banner over the spot that marked the middle of the Rotunda, twenty-eight other activists, clad in orange jumpsuits and black hoods, were refusing to move from the steps outside the Capitol building. Our group inside formed a semicircle, and each of us adopted the name of an imprisoned detainee. If someone had told me a year ago that I would find myself in Washington D.C.’s Central Cell Block, providing the police with only the name of a Guantánamo detainee and not my own, I would have been struck with disbelief. This courage was found through the experience of a twelve-day fast in the midst of a deeply connected and inclusive community. I have wondered how the prisoners who endure torture, indefinite detention and the loss of beloved friends at Guantánamo, Bagram, or any of the other U.S. secret prisons around our world find the courage and will to continue living. From what I’ve read and heard, they turn to community, faith and an abiding hope to be reunited with loved ones. Jerica Arents teaches peace studies at DePaul University in Chicago, where her ongoing interests focus on social movements and activism. Her research is on peacemaking in Afghanistan and the effects of the NATO-led occupation on ordinary Afghans. She also facilitates nonviolent direct action trainings and anti-racism workshops for young folks and adults.